No matter where I go or where I live, I have always identified with West Virginia as my home, no matter what. And some people used to kind of look askance at me at for saying [that]. When anybody asked me, without a minute’s hesitation, I have always been like that. And they said, ‘But you don’t live there, and you haven’t lived there.’ I said, ‘Well, what does that matter? You identify with where you are from, wherever it is. That’s the place I always identified as being from, and that’s it. I don’t apologize for it. That’s where my home base was. Quoted by John Lilly in “West Virginia, My Home: A Visit With Hazel Dickens,” Goldenseal magazine, Summer 2004. Singer, songwriter, and social activist Hazel Dickens excelled in a bluegrass music career that spanned more than fifty years. She served as a role model for women performers in bluegrass, old-time, and country music. Although soft-spoken and reserved, she left a body of songs that spoke loudly for the condition of her fellow men and women. Her songs also painted wistful images of her native West Virginia and the mountain people she knew. Hazel Dickens was born and grew up in Montcalm, West Virginia, a tiny hamlet situated in Mercer County, one of the southernmost counties in the state. Her parents, Hilary Nathan (H. N.) Dickens and Sarah Aldora Simpkins Dickens, were from the musically rich counties of Floyd and Carroll in southwestern Virginia. Her father, a Primitive Baptist preacher who hauled timber for coal mines, was fairly proficient on the banjo and was known to have a sturdy singing voice. The eighth of eleven children, Hazel was reared in a home of meager means. Her father was a strict disciplinarian who often controlled the social activities of his wife and children. That, coupled with an education that ended in the seventh grade, left Hazel initially lacking in the self-confidence and sophistication of later urban peers. Early in her youth, Hazel developed a fascination for song lyrics. Oftentimes she would transcribe songs she’d heard on the radio or from family into composition books. Sometimes she would clip lyrics from various country music magazines of the day. It was the start of an appreciation for words that would serve her well later in life. By the early 1950s, several of Hazel’s sisters had moved to Baltimore in search of work. In 1951, she began the process of transitioning there as well and made several moves back and forth. In 1954, a Greyhound bus carried her on a move that would be permanent. Hazel’s transition to city life was awkward—her work as a waitress provided little pay or dignity—but there was comfort in being surrounded by other families who had likewise migrated from West Virginia. Some sections of the city were known, not too affectionately at the time, as Little Appalachia. Soon after her final move to Baltimore, Mike Seeger came into the lives of Hazel and her brothers and sisters. An enthusiast of old-time and bluegrass music who came from a decidedly urban background, Seeger was enthralled with the Dickens’ rural connections to the music. A series of regular jam sessions soon followed, along with occasional forays into public performance at bars and clubs. Hazel played bass and often contributed tenor harmonies. A number of music parties took place at the home of Willie Foshag and Alyse Taubman (Mike Seeger lived in the apartment below them). Taubman was a social worker who developed a close connection with Hazel and her family; Hazel credited Taubman with helping to improve her social skills. During this time, Hazel was introduced to her future singing partner, Alice Foster (Gerrard), although it was several years before the duo came together as a performing unit. Their public debut came in 1962 at the annual fiddlers convention in Galax, Virginia. Two years later, a house party was attended by up-and-coming record producer Peter Siegel and budding mandolin player David Grisman. That pair set in motion the making of an audition tape that landed a record deal for Hazel and Alice with Folkways Records. The first Hazel and Alice album, Who’s That Knocking?, was recorded in 1964 with a cast of supporting musicians that included fiddlers Chubby Wise and Billy Baker, banjo player Lamar Grier, and mandolin players Peter Kuykendall and David Grisman. The album was released in 1965 and was groundbreaking in several ways. It introduced the first of Hazel’s songs (“Cowboy Jim”) to record, and it was the first time that a pair of women had fronted a bluegrass band. The middle and late 1960s were eventful for Hazel. She married folk music enthusiast/counselor/taxi driver Joe Cohen, recorded a second album with Alice, developed her social skills, became part of a group assembled by Mike that was known as the Strange Creek Singers, and continued to shape her writing. The Strange Creek Singers recorded one album and it debuted one of Hazel’s first songs of social commentary, “Black Lung.” She wrote it not long after one of her brothers died from the condition. Hazel’s marriage to Cohen was short-lived, and by the end of decade she was single and relocated to Washington, D.C. It was here that her songwriting began in earnest. Throughout the 1970s, Hazel balanced day jobs with music-making activities which increasingly centered on social activism and songs of protest. A key outlet was Hazel and Alice’s involvement with the Southern Folk Cultural Revival Project, an initiative that strived to present racially integrated groups of artists performing to integrated audiences throughout the South. The tours also had the effect of helping Hazel overcome her embarrassment about an impoverished Appalachian upbringing. Not coincidentally, her “West Virginia My Home” appeared on the 1973 Hazel and Alice album, the duo’s first for Rounder Records. Just as Hazel and Alice’s second Rounder album was set for release in 1976, Alice felt the need to develop her identity as a solo performer. This necessitated a similar shift for Hazel. Circumstances soon conspired to promote Hazel’s solo career; that same year four of Hazel’s songs were featured in the film Harlan County USA. This led to increased appearances at miner’s union meetings and rallies. As the 1970s drew to a close, Hazel quit her day job and concentrated on making a living solely from her music. Choosing a modest lifestyle, Hazel was able to be selective in her performance bookings. One invitation she gladly accepted was an invitation from President Jimmy Carter to appear at the White House on Labor Day in 1980. Hazel continued her relationship with Rounder Records. During the 1980s, the label released three of her albums: Hard Hitting Songs for Hard Hit People, By the Sweat of My Brow, and It’s Hard to Tell the Singer from the Song. Not only was the label an outlet for her recorded works, it was a place where she could impart her knowledge of traditional music. She developed a close friendship with Rounder co-founder Ken Irwin and frequently sat in on auditions for prospective artists. Other outlets for Hazel’s music were found in the 1986 film Matewan; a 2002 documentary about her life titled for her most recent Rounder release, It’s Hard to Tell the Singer from the Song; and a 1996 trio recording, Heart of a Singer, that paired her with tradition-based performers Carol Elizabeth Jones and Ginny Hawker. In addition to concert, festival, and social justice work in the United States, Hazel gave performances in Cuba, Canada, Australia, and Japan. At home, she held forth at many of the nation’s most prestigious venues, including the Kennedy Center, Lincoln Center, Carnegie Hall, Madison Square Garden, the Grand Ole Opry, and the Library of Congress. Recognition for Hazel’s achievements began flowing in the 1990s. 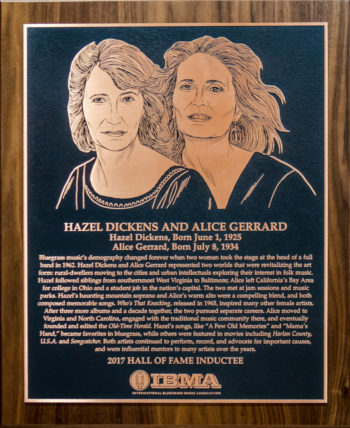 In 1993, the International Bluegrass Music Association bestowed their Distinguished Achievement Award upon her, she was inducted into the Society for the Preservation of Bluegrass Music’s Hall of Greats (1995), the Smithsonian Festival of American Folklife presented a special program called “Hazel Dickens: A Life’s Work” (1996), Shepherd College presented Hazel with an honorary doctorate (1998), the National Endowment for the Arts awarded her with a fellowship (2001), and the National Folk Alliance offered her a Lifetime Achievement Award (2002). If I have a religion, that’s it: to take what I have and be able to share it with somebody that needs it. If there’s any religion in my life, it’s for the working class. And I want to be that way as long as I have a breath. Quoted by Caroline Wright in “Hazel Dickens: A Bridge Between Two Worlds,” Bluegrass Now, December 2001. I just wanted to play. I didn't care who with or what. I just wanted to do it. And I persevered through all of that stuff, being unrehearsed, getting up there without hardly even knowing the chords to the songs. I was just sticking my nose out there. I knew that I knew all of the songs . . . I knew every bluegrass song coming and going and most country songs. We have had women come up to us all down through the years and talk about the first records we made and what an impact it had on their lives. I just think it was an eye-opener for a lot of people to hear two women singing together, doing what the men did in bluegrass. We sang all the parts of bluegrass—one woman (Alice) singing the lower part and the other woman (Hazel) singing the high tenor. Generally when a woman sang, a man would sing under her—or they sang with their husband or brothers. So, in that way, this recording was a real groundbreaker. We also didn’t try to spice it up, or pretty it up with one of those Nashville songs or a Kitty Wells song. We did it straight-up bluegrass. Hazel Dickens, in liner notes to Hazel Dickens & Alice Gerrard: Pioneering Women of Bluegrass, Smithsonian/Folkways Records, 1996.